Remember when fighting games were all about simplicity? When they were more about zoning, tactics and mindgames instead of learning extensive move lists, complicated game mechanics and memorizing pages and pages of combos? If you're one of these gamers who yearns for the fighting games of yesteryear, One True Studios and Iron Galaxy Studios have the game for you: Divekick. The premise behind Divekick is as simple as the title: you jump, you dive, you kick. Divekick uses two buttons and two buttons only, and if you're observant you can guess their functions: one to jump, and one to kick, or dive. The first person to kick the other player wins. That's all there is to it. What this means is that Divekick is all about strategy. If you dive too early, you might be opening yourself up for a counter attack. Jump too high, and you might miss your target, again opening yourself up for a counter attack. Matches in Divekick are intense, as one mistake will end up with you losing. Tension is thick, emotions will run high; playing Divekick with friends is as much a fun activity as it is the quickest way to replace a friendship with hatred. Despite it's simple premise, that's not all Divekick has going for it, as the game does feature some interesting game mechanics outside of diving and kicking. For example, a super meter will fill as you dive and kick, enabling your character to unleash a special move which can give you an advantage if used correctly. Kicking a player in the head will empty that player's special meter and also cause him to be in a dizzy state at the beginning of the next round. Like the original premise, these extra mechanics are easy to pick up and anyone, whether you're a fighting game veteran or someone who has never played a fighting game in his life, can be a Divekick master. That is the beauty of the game: it puts all players on equal footing. It's as much as a game about reflexes as it is about critical thinking. 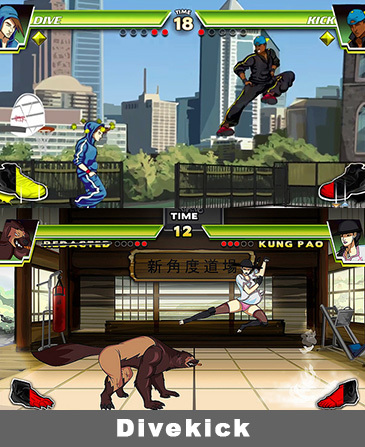 Like any fighting game, Divekick features multiple characters to choose from, each with their own super moves. For example, your character may jump forward in an arc, open a portal to another part of the level or float in the air. While these specials are powerful, using them inappropriately will lead to a quick defeat. On the surface, Divekick is a lot more complicated than it looks and, like in all fighting games, choosing the right character for your playstyle is of the utmost importance. The fighters in Divekick are either parodies of other fighting game characters or players within the fighting game community. Eagle-eyed gamers will spot parodies of Marvel Vs. Capcom's Dr. Doom, Street Fighter III's Yun and Mortal Kombat's Kung Lao, for example. Divekick is full of fighting game in-jokes and, while you don't need to be a fighting game fan to appreciate the game, fans of the genre will find themselves laughing out loud at the many, many references. Divekick is a game that doesn't take itself seriously but is a serious game all at the same time. Iron Galaxy has team with Deep Silver to provide the PlayStation 4 version with a very special bonus: a playable Johnny Gat, one of the most popular characters in the Saints Row franchise. Divekick will be available via the PlayStation 4's PlayStation Network as a digital download sometime in early 2014. While no price has been announced, it's safe to assume that it will carry the same $9.99 price tag as it does on other systems. If you're a competitive gamer or just looking for a game to play with friends, definitely give Divekick a chance. While it likely won't replace Injustice as your go-to PlayStation 4 game, it makes an excellent companion. PS4 Experts readers, will you be buying Divekick when it hits the PlayStation 4? Let us know in the comments!